In Fidel Castro's Cuba, speaking unpleasant truths about the regime — for instance, that it is lead by a band of murdering thugs — is never tolerated. Defying the dictatorship by reminding Cubans, and the world, of the crimes committed by Castro and his cronies, is dealt with swiftly and harshly. 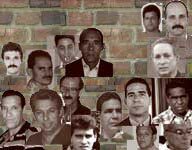 Lázaro Miguel Rodriguez Capote and other dissidents learned that in February 2002, when they tried to publicly commemorate the murder of four people — including three American citizens — in the Brothers to the Rescue shootdown on Feb. 24, 1996. Family members have been told unofficially that charges may include "resistencia," resistance; "desacato," disrespect; and "desorden público," public disorder. However they apparently have yet to be officially charged, and Amnesty International is not aware that any trial date has been set. Among other activities, over the last year Emilio Leyva and Lázaro Rodríguez were reported to be active members of the Proyecto Varela campaign for a referendum on constitutional human rights reforms in Cuba. Numerous activists involved in the petition drive have been harassed and detained. Both men were reportedly held in custody for several hours in early February following a prayer service on behalf of political prisoners, in which Leonardo Bruzón was also said to have taken part. More than 5 years later, Rodríguez, now 38, still has not had his day in court. Mr. Rodríguez Capote is a member of the Cuban Pro Human Rights Party and a peaceful pro-democracy activist in totalitarian Cuba. As an opponent of the tyrannical regime in Havana, he has worked for basic human rights for the people of Cuba despite constant harassment and repression because he believes the Cuban people are entitled to basic human rights and democracy; in other words, freedom from tyranny. On February 24, 1996, three U.S. citizens and a resident of Florida were assassinated when two civilian Brothers to the Rescue aircraft, on a humanitarian mission, were destroyed in international airspace by Cuban MiGs on the direct order of the Cuban dictator. The downing of the Brothers to the Rescue airplanes over international waters by the tyranny left an indelible impression on the consciences of Cuban pro-democracy activists and in countless millions throughout the world. Mr. Rodríguez Capote was one of the many human rights activists in totalitarian Cuba who sought to commemorate the tragic deaths of these men but who was prohibited from demonstrating by the tyranny. Although Mr. Rodríguez Capote was threatened by state security thugs prior to his participation in peaceful demonstrations, he refused to allow his voice to be silenced. Consequently, he was wrongfully arrested on February 22, 2002 on trumped-up charges of "espionage and enemy propaganda." Mr. Rodríguez Capote was summarily incarcerated and to this day languishes in grotesque subhuman conditions without having even been tried for a single crime. He is being held indefinitely in a totalitarian dungeon, suffering abhorrent conditions because he refuses to accept the reality inflicted upon Cuba by the tyranny. Since his incarceration he has held several hunger strikes to attract attention to the plight of Cuban political prisoners. Mr. Rodríguez Capote is one of the many heroes of the peaceful Cuban democratic movement who are locked in the dungeons of the dictatorship for their beliefs. These men and women are symbols of freedom and democracy, who will always be remembered when freedom reigns again in Cuba. Madam Speaker, let me be very clear, the brutal repression practiced by the tyranny in Havana is incompatible with the democratic values and the international law of our hemisphere. Mr. Rodríguez Capote is suffering in a dungeon because he believes in freedom, democracy and human rights. My Colleagues, we must demand the immediate and unconditional release of L ázaro Miguel Rodr íguez Capote and every prisoner of conscience in totalitarian Cuba.